Eating good at Base Camp. Enjoying a fondue dinner. It’s September 30 and I’m calling you from Base Camp. The last day of September. You approach this route and begin to prepare it in September. You climb it in October. And that’s a good thing because now that September is winding down  I’m sitting watching it snow at Base Camp  we’ve got a long ways to go. But then we’ve got October. So we’re going to make it in due time as the mountain allows us to advance. I just talked to Camp 2. Shom the Camp 2 cook has moved in so that makes us more eager to get up there. And I might mention that Shom has been one of the famous Camp 2 cooks over the years, since 1990 when he first worked up there with me. He has moved in, he’s cooking for a crew of the Sherpas. Today, I awoke very, very early and saw that we had a lot of new snow. I talked with Ang Temba and we decided that myself and the rest of the climbing team as well as Nima Tashi and some of the Icefall Doctors would not proceed and try to join the others at Camp 2. Just too much snow. 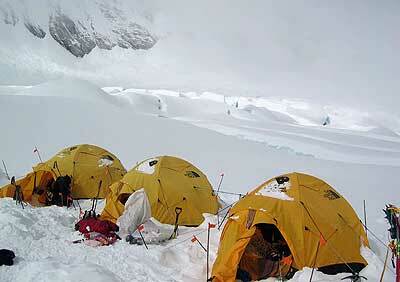 We talked to Camp 2 a little later and they confirmed it was snowing and quite windy there. Tonight we have perhaps more of the same but everyone’s sitting tight and we’ll see what happens tomorrow. Meanwhile, here at Base Camp we’ve had the great pleasure of having some really fine guests. 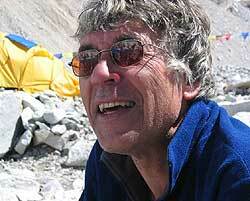 Roger Bilham  our dear friend, “Adventure Scientist”, surveyor of Everest and this region and especially a chronicler of a lot of data over the years that is going to be really valuable for studying earthquakes and other things in this area. A superb geologist, scientist, teacher and a good friend. Roger showed up, spent some time with us. I tried to relate what that was like, what an honor it was, in some of the photos we sent back. And he breezed off down the trail to other adventures and other tasks. Then we had Jean and Mark from Calgary visit. Jean is actually the doctor down at Khunde, the clinic just above Namche. They came in and had a great visit with us. As well as, Mike Lu, one of the physicians down at the Himalayan Rescue Association Clinic  they’ve apparently set up shop now. And also there’s this great French film team that came up. They’re doing what seems to be really great project to kind of relate what portering is like in the Khumbu Region, the Everest Region  the realities of it and what the whole system is like. 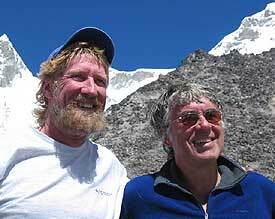 And of course that relates to our Sherpas and expedition life very closely. We had a great time with Phillippe and the rest of the crew  enjoyed having them here and did some interviews with them. 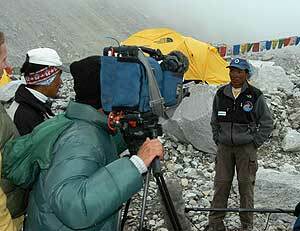 And especially it was nice to see Nima Tashi get center stage and do an interview with a great Sherpa translator for French television. So life’s never dull around here. Maegan is obviously  as the trekkers come into Base Camp from down valley and start asking questions  she’s obviously the exciting hot topic in the Everest region this season. And deservingly so. All the trekkers come in asking about her, wanting to see her, meet her, and of course she’s almost always available to talk about her dream, her project, her motivations and people always seem thrilled and honoured to have met her before they walk away from Base Camp. I’m going to get up again with Ang Temba first thing tomorrow morning and evaluate the weather. And who knows, the next time I call you it may be from Camp 2. But once again, it’s still September and we’re still preparing to climb this mountain. By tomorrow, October, maybe we’ll be a step further, closer to our dream of reaching the summit of Everest sometime in October, 2003.